Voice of the Collector: 2007 SP Legendary Cuts Case Break HURRY!! 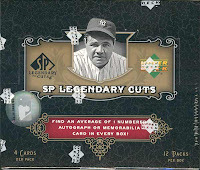 Trying to find 20 people interested in breaking a case of SP Legendary Cuts from '07. Slots would be $45 and would cover the case and all shipping. Leave a comment if interested. This is through a special Blowout Cards is having which ends at 3pm EST. Configuration: 16 boxes per case. 12 packs per box. 4 cards per pack. * Two cut signatures per case, on average! * Hobby First - Look for one Reel History card every 3 cases; the 1 of 1 cards will feature a frame from a vintage filmstrip starring baseball greats Babe Ruth and Lou Gehrig! * Find one numbered autograph or memorabilia card per box! * Find cut signatures with memorabilia, dual and quad cut signatures, themed cuts, and historical cuts! Cut Signature Cards - Falling TWO per case, on average! Memorabilia and Signature Cards - Combining to fall one per box, on average! * Legendary Materials and Parallels - Numbered to 299 or less! * Reel History - Authentic vintage film strips featuring Yankee legends Babe Ruth and Lou Gehrig! I like this set. I'd be willing to give it a go. I am with JD...interested but want to know more.